Holiday Fried Pecans are flash-fried to make a sweet, salty, crunchy treat. Made in Louisiana from an old family recipe, you can eat them straight or on top of ice cream, salads, sweet potatoes and more. Dimensions: 8.2" x 6.25" x 3"
We ordered these for the holidays and fell in love with them. Best pecans ever! Now we always keep a tin on hand for snacking. Get you some! Really! I’ve used these as my go to gift for years. Even gift myself. 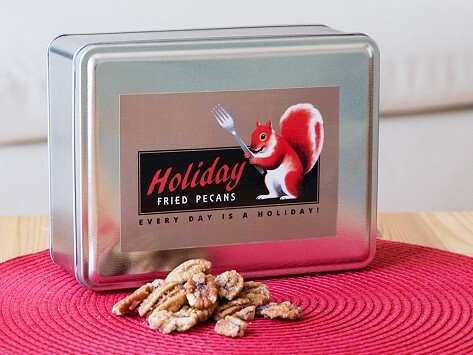 Holiday Fried Pecans are 100% organic, gluten-free pecans that are a little sweet, a little salty, and whole lot delicious. These Louisiana pecans are a perfect snack whether you’re watching the game, tiding yourself over until dinner, or want to top your sundae with something special. Made with simple ingredients like sugar, salt, and soy oil, they’re flash fried—just enough to get a great crunch, but not enough to absorb much oil. And the taste, well . . . we had to make sure we didn’t eat them all before we could photograph them for our site. They’re that good. We also like the way they’re made. Founder Keith Baum works directly with pecan orchards, then Holiday makes the pecans themselves right in their Louisiana commercial kitchen. Keith grew up around pecan trees and harvested them regularly for his grandmother. Then in 2010, he came across a long-lost family recipe for pecans… and the rest is history. Satisfy your craving with a snack that’s a little sweet, a little salty, and 100% Made in the USA.